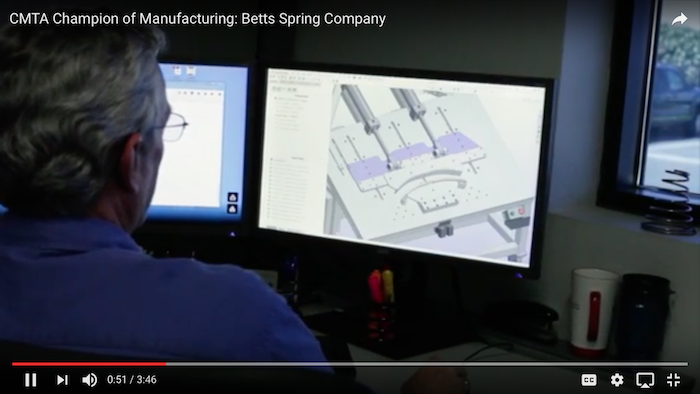 Betts Spring Manufacturing: Vision, innovation, and new skills propel traditional manufacturer to make big impact on working families and overall economy. Sacramento, CA-- Today, on Manufacturing Day, the California Manufacturers & Technology Association (CMTA) announced its ninth Manufacturing Champion, Betts Spring Manufacturing out of Fresno California, with a recognition video that highlights the company’s tremendous innovation, economic impact and focus on new skills. CMTA's Champions recognition program honors positive contributions by manufacturing companies who are committed to California and exemplify the high principles of economic growth, innovation, entrepreneurship, and commitment to their employees and communities. CMTA honored eight Champions over the past two years and the Association continues to use the program to demonstrate the sector's incredible impact on the economy and the communities where they reside. Betts' operations were a perfect fit for the recognition program, as you'll see in the video. The company provides highly skilled jobs -- equally as impressive as any Silicon Valley production job -- making precision products. Their employees’ world class and technical skills are developed through regional collaborations lead by Betts with community colleges, high schools and government institutions. "We are so proud to recognize such an innovative California company on Manufacturing Day,” said CMTA president Dorothy Rothrock. “Betts Spring shows us all what one visionary manufacturer can bring to a community. With a large technically skilled workforce, more than 700 suppliers in 48 counties and more than 1,000 customers in California, Betts gives us all the reasons we need to do everything we can to retain and grow manufacturing in the state." Betts Spring Manufacturing, a 148-year-old spring manufacturer, has deep roots in California. Currently in its sixth generation of family ownership, the spring manufacturer opened in 1868 in San Francisco. Founder William Michael Betts, a native of England, was recognized by the Queen for making superior carriage springs for horse drawn carriages. Betts set up a spring manufacturing business in the bustling Northern California port city after immigrating to the United States in 1860. Several generations later, the company branched out into manufacturing for the heavy duty transportation sector and invented and patented the ubiquitous mud flap hanger, built to withstand constant pressure from a 40-ton 18-wheeler. Mike Betts moved the company to Fresno in 1991 and has stepped up to be a committed steward of his new home. Today the company uses precision welding and advanced manufacturing technology to make high quality coil, leaf springs, stampings and a host of proprietary parts for a variety of industries. Since moving parts often require springs, Betts products are used by the automotive aftermarket, medium and heavy truck OEM and aftermarket, construction, agriculture, oil & gas, mining, military and trucking.